On the 11th (Thu), steep yourself in history at Santa Fe Plaza. For ratings, other places to visit, photos, and other tourist information, refer to the Santa Fe trip planner. Philadelphia to Santa Fe is an approximately 8.5-hour flight. You can also do a combination of train, flight, and shuttle; or drive. Due to the time zone difference, you'll gain 2 hours traveling from Philadelphia to Santa Fe. Traveling from Philadelphia in July, Santa Fe is slightly colder at night with lows of 60°F. Finish your sightseeing early on the 12th (Fri) to allow enough time to travel to San Luis Obispo. San Luis Obispo, or SLO for short, is a city in the U.S. Escape the urban bustle at Moonstone Beach and Elephant Seal Rookery. Explore hidden gems such as Morro Rock and Niner Wine Estates. Explore San Luis Obispo's surroundings by going to Piedras Blancas Light Station (in Cambria) and San Simeon (Hearst Ranch Winery & Piedras Blancas). It doesn't end there: race across the water with a speed boat tour and tour the pleasant surroundings at Fisherman's Beach. To see where to stay, photos, and other tourist information, use the San Luis Obispo sightseeing planner . Getting from Santa Fe to San Luis Obispo by flight takes about 6 hours. Other options: do a combination of shuttle and flight; or drive. The time zone difference when traveling from Santa Fe to San Luis Obispo is minus 1 hour. While traveling from Santa Fe, expect slightly colder days and about the same nights in San Luis Obispo, ranging from highs of 80°F to lows of 56°F. Cap off your sightseeing on the 15th (Mon) early enough to travel to Los Angeles. Kick off your visit on the 16th (Tue): find something for the whole family at Universal Studios Hollywood. For ratings, photos, and tourist information, refer to the Los Angeles online vacation planner . You can fly from San Luis Obispo to Los Angeles in 3.5 hours. Other options are to drive; or take a train. Traveling from San Luis Obispo in July, you can expect nighttime temperatures to be a bit warmer in Los Angeles, with lows of 66°F. Cap off your sightseeing on the 16th (Tue) early enough to travel to Las Vegas. 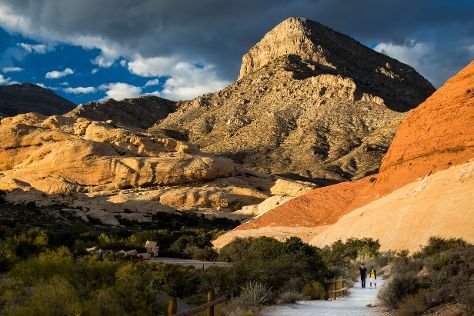 On the 17th (Wed), see the interesting displays at The Mob Museum and then take in breathtaking views at Red Rock Canyon National Conservation Area. Get ready for a full day of sightseeing on the 18th (Thu): wander the streets of The LINQ Promenade, then take in nature's colorful creations at Bellagio Conservatory & Botanical Gardens, then get a taste of the local shopping with The Strip, and finally ponder the design of Bellagio Fountains. For where to stay, traveler tips, other places to visit, and other tourist information, you can read our Las Vegas online road trip planner . Getting from Los Angeles to Las Vegas by flight takes about 4 hours. Other options: drive; or take a bus. Expect much warmer weather when traveling from Los Angeles in July: highs in Las Vegas hover around 104°F, while lows dip to 81°F. Finish your sightseeing early on the 18th (Thu) to allow enough time to travel to Moab. Kick off your visit on the 19th (Fri): explore the striking landscape at Wilson's Arch and then head off-road at local off-road trails. Here are some ideas for day two: take a memorable tour with Tours, then explore the striking landscape at Delicate Arch, and then take in the dramatic natural features at Turret Arch. To find other places to visit, where to stay, maps, and other tourist information, read our Moab trip maker . Traveling by combination of flight and car from Las Vegas to Moab takes 5 hours. Alternatively, you can drive; or fly. You'll lose 1 hour traveling from Las Vegas to Moab due to the time zone difference. Expect slightly colder temperatures when traveling from Las Vegas in July; daily highs in Moab reach 97°F and lows reach 67°F. Wrap up your sightseeing on the 20th (Sat) early enough to drive to Durango. On the 21st (Sun), don't miss a visit to Historic Downtown Durango, shop like a local with Scenic Aperture Gallery, and then take a memorable tour with Tours. On the next day, delve into the distant past at Spruce Tree House, delve into the distant past at Balcony House, and then delve into the distant past at Cliff Palace. To find photos, reviews, ratings, and more tourist information, go to the Durango trip itinerary site . You can drive from Moab to Durango in 3.5 hours. Another option is to do a combination of car and bus. Prepare for slightly colder weather when traveling from Moab in July: high temperatures in Durango hover around 86°F and lows are around 54°F. Wrap up your sightseeing by early afternoon on the 23rd (Tue) to allow enough time to travel back home.